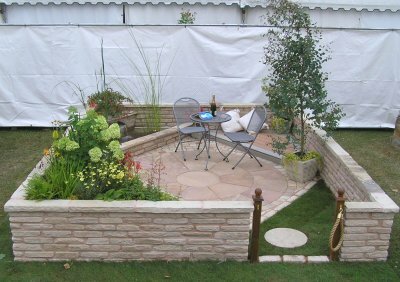 Shropshire Garden Design Ltd entered their first Shrewsbury Flower Show event in 2006 with a show garden demonstrating how even a small space can be fully utilised into a practical outdoor living area. 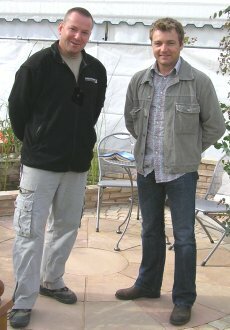 The judges included TV gardening presenter Chris Beardshaw. 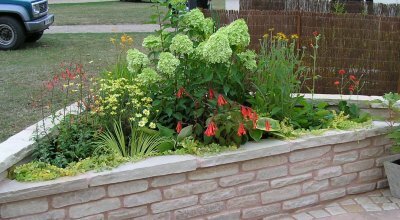 As our lives get busier our needs are changing and many people are now looking for a practical low maintenance solution to their garden. This need has been reflected in the ratio of hard and soft landscaping within the garden. Our Shrewsbury Flower Show show garden was based around a simple diamond pattern, designed to maximise the space available within the area allocated. The predominant material used was natural sandstone. Our Shrewsbury Flower Show show garden drew a lot of attention from judges and public alike and we would like to thank everyone for their support especially Shropshire Horticultural Society for organising the event. Tickets are available for the 2017 Shrewsbury Flower Show from the Shropshire Horticultural Society, see the Shrewsbury Flower Show link at the top of the page. Central area - The central area within the diamond (50% of the space available) was set aside for a patio and could comfortably accommodate a table and chairs. 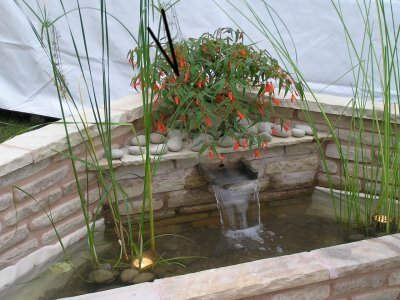 Far left - We created a simple but subtle water feature. Water passes through channels into a sump located behind the waterfall, and is pumped up and through the sandstone wall. 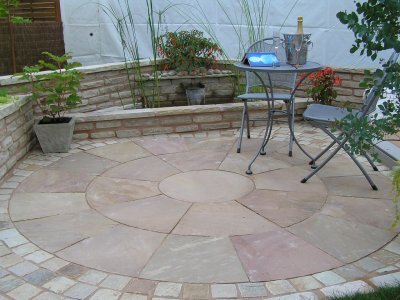 The corner piece of sandstone can be removed to maintain the pump as required. Far right - Increasingly hot summers cause traditional timber decking to warp but decking is still popular. One solution is the use of new Wood Plastic Composites using recycled hardwood fibre and Polypropylene plastic as demonstrated here. Near left - The plants in this raised bed and the associated planters, were chosen for mid to late summer and autumn interest. They were also selected as good companions in a raised bed with rich and moist, yet well drained soil in a sunny position. They would be under planted with bulbs to give a good display in the spring and early summer. 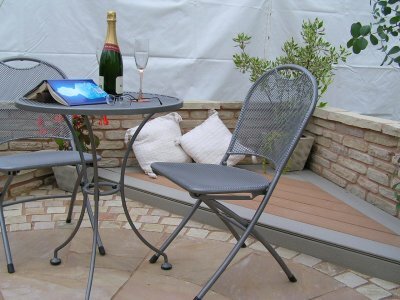 Near right - A small turf area providing access into the garden. Tickets are available for the Shrewsbury Flower Show 2017 from the Shropshire Horticultural Society, see the Shrewsbury Flower Show link at the top of the page.